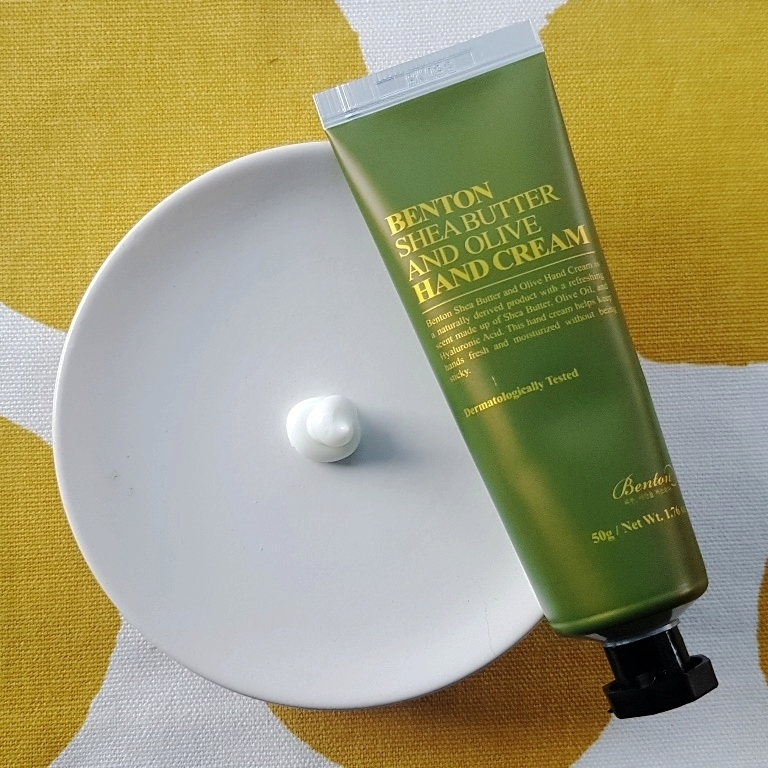 The Benton Shea Butter And Olive Hand Cream claims to moisturise and soothe hands throughout the seasons without leaving a tacky residue. Firstly, let us consider the star ingredients of the hand cream. Shea Butter is a plant-based emollient that mimics the lipid content of skin to promote a soft, smooth, healthy appearance. It features at an impressive 10% concentration. Olive Oil, (2%) is extracted from compressed olives. It contains powerful antioxidants which help to protect against premature ageing by restoring skin smoothness and fighting free radicals. 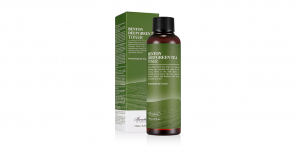 Olive oil penetrates deeply to provide both cleansing and moisturising effects. 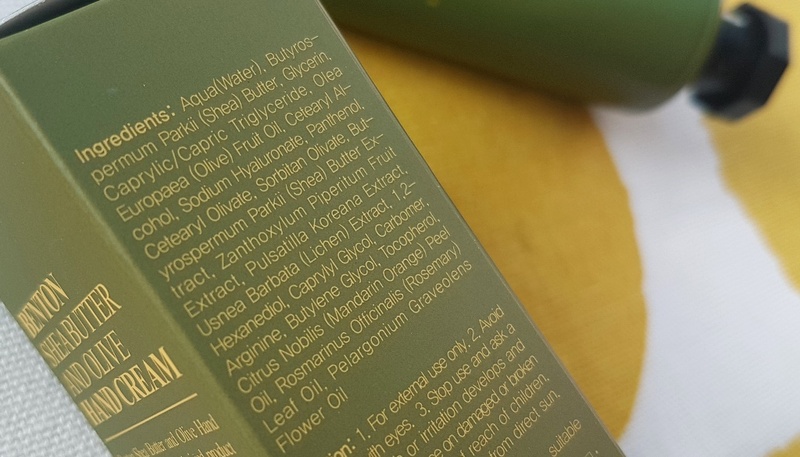 Furthermore, often coexisting in cosmetic formulations, Cetearyl Olivate and Sorbitan Olivate present a unique natural emulsifier derived from olive oil which reduces water loss and moisturises the skin. Glycerin, a powerful humectant, and Caprylic/Capric Triglyceride, an excellent emollient derived from coconut oil and glycerine, follow water and shea butter in terms of concentration. Together they assure replenishing and restorative effects to help achieve normal skin balance and hydration. There are many moisturising ingredients. Able to improve dry and damaged skin with high fatty acid content, Cetearyl Alcohol assists to reduce flaking and restore suppleness. Vitamin B5, Panthenol, effectively penetrates the skin, able to reach into the lower layers for considerable cell absorption and hence effective moisturisation. Due to its low molecular size, Sodium Hyaluronate can reach deep into the dermis to combine with, maintain and attract water making it a superb natural moisturiser. 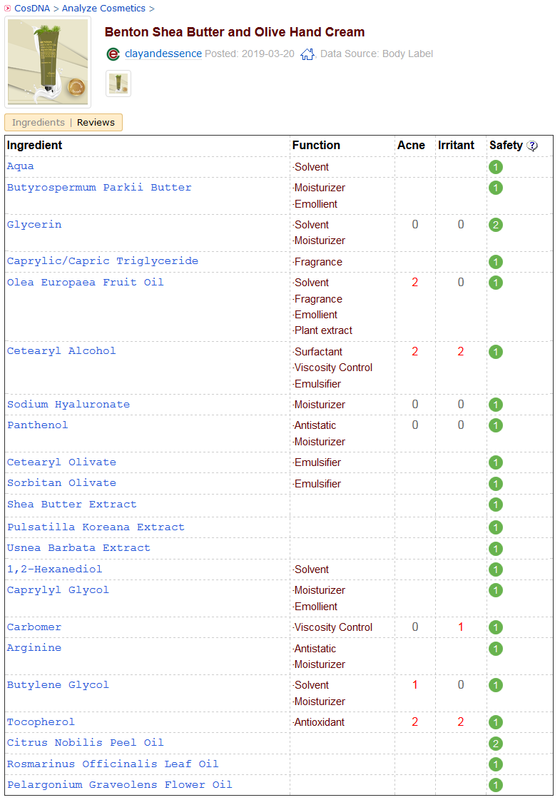 Adding support to more prominent humectants (Glycerin, Pentylene Glycol and Betaine), Butylene Glycol additionally assists to increase the penetration of other ingredients and hence boost their effectiveness. There are also a few essential oils in the formula including Mandarin Orange Peel, Rosemary Leaf and Geranium Oils included for healing and natural fragrance. Extracts from Korean Pasque Flower and Lichen contribute antimicrobial properties and natural preservative activity. 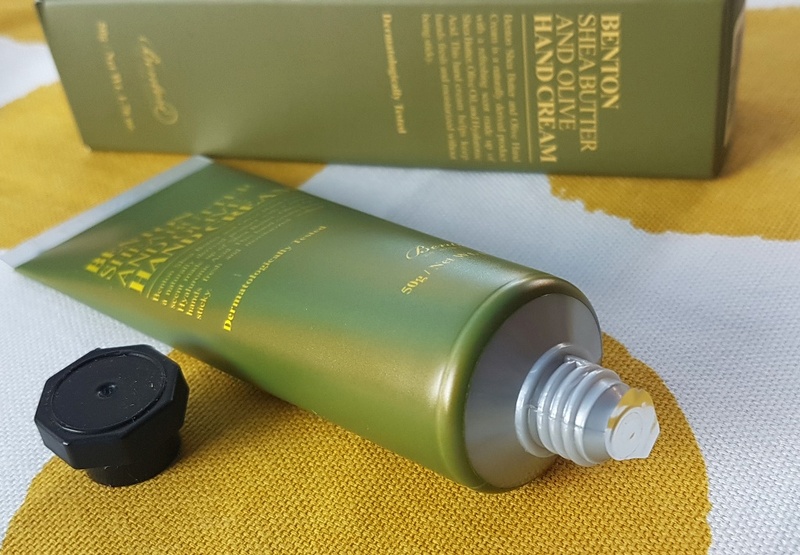 The Benton Shea Butter And Olive Hand Cream is presented in a cardboard box, the product contained within a plastic tube with screw top lid. When new, the opening is protected with an aluminum foil seal. 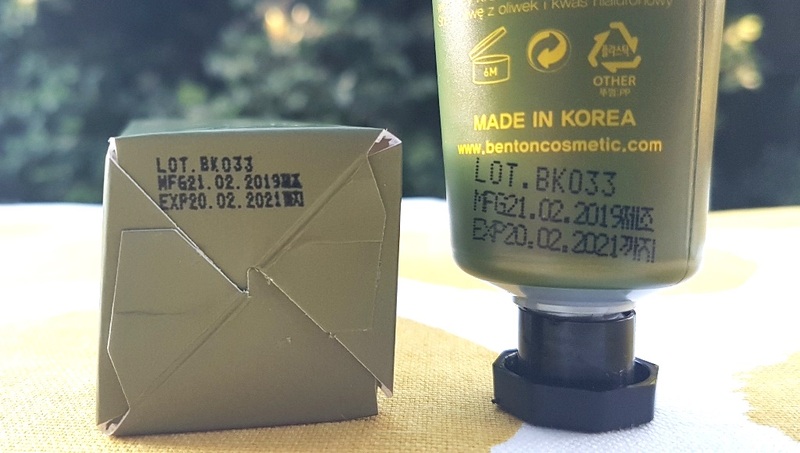 Ideal assessments are returned by both the CosDNA and EWG resources, rating the Benton Shea Butter And Olive Hand Cream a low hazard without warning flags. Apply a suitable amount and smooth onto hands as required. 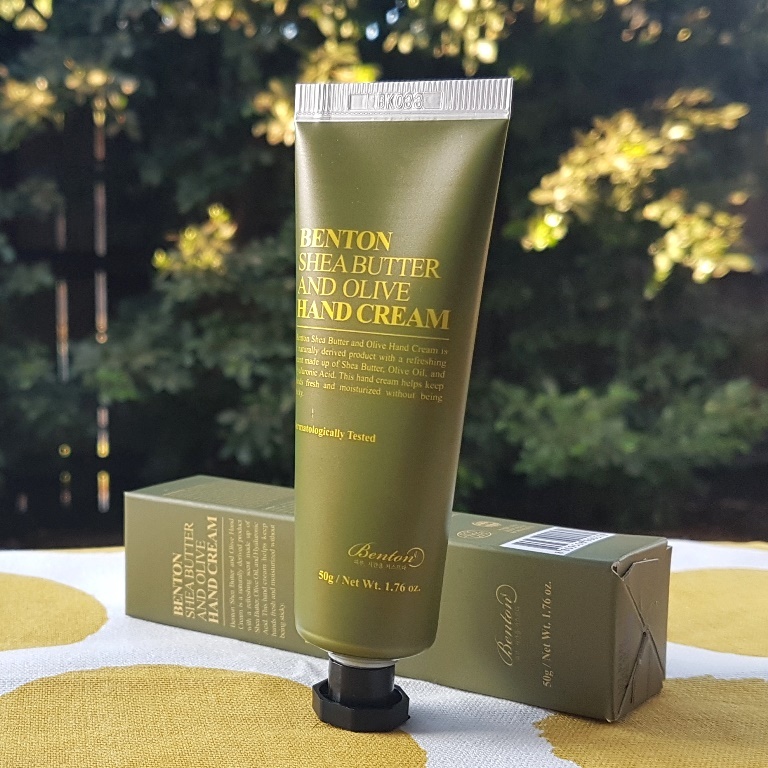 The Benton Shea Butter And Olive Hand Cream is free of added fragrance however does release a natural scent derived from essential oils. 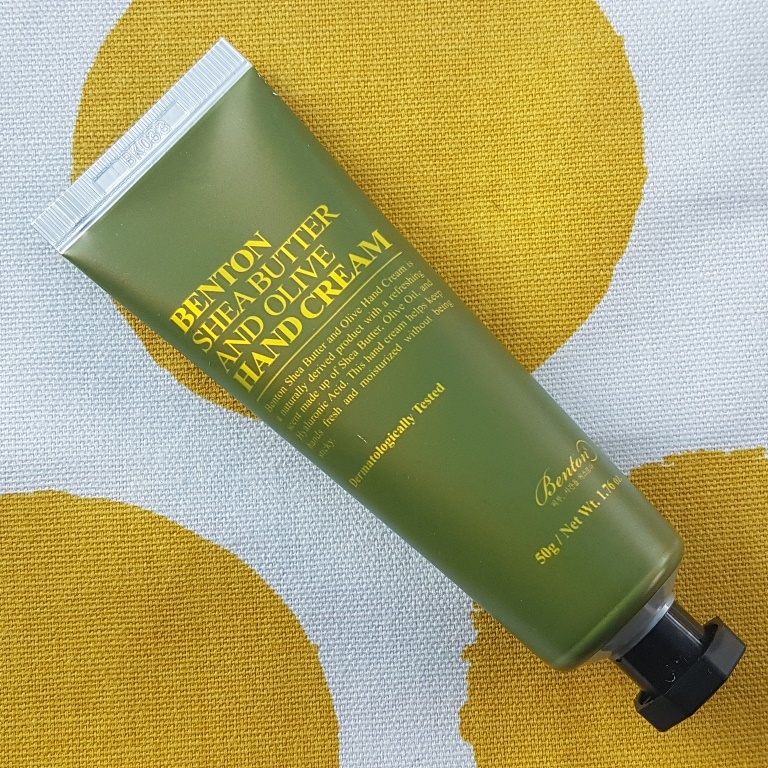 The 50g tube of Benton Shea Butter And Olive Hand Cream costs approximately USD$10.00. The hand cream has a 2 year shelf life and must be used within 6 months of opening. As mentioned in previous Benton reviews, the company name is inspired by the movie The Curious Case of Benjamin Button in which the protagonist reverses the ageing cycle and grows younger with time. This reflects the brand’s desire to restore skin back to its original, healthy condition without resorting to using harmful ingredients. With an all green EWG rating and CosDNA approved formula, this hand cream certainly fulfils the company objective. Presented in gold and green colours to reflect the hero ingredients of shea butter and olive oil, packaging is stylish and highly portable. The 50g tube easily slips into a pocket or purse and the screw top lid ensures no unexpected spillage. The black cap is designed to allow the tube to stand upright, promoting product flow to the opening. The scent is naturally derived from essential oils of mandarin orange peel, rosemary and geranium. It is not a strong scent, nor is it floral, rather fresh and pleasant. I really like the delicate smell which lingers for a few minutes after application. The cream itself is a clean white colour while the texture is silky and buttery, sufficiently dense to hold its form. It soaks into the skin effortlessly and quickly with gentle rubbing to leave a near matte finish without tackiness or stickiness. There is a dewy glow left behind and although the residue is pleasant, there is definitely a layer of comfort remaining on the skin for around 20 minutes after application to help lock in moisture. It’s not greasy but definitely noticeable, keeping skin supple. 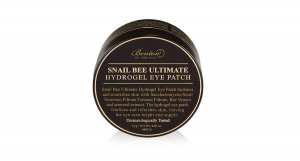 As this layer dries down completely, it goes back to completely matte however, still retains a softness that remains until the next application, indicating long lasting hydration. As with any hand cream, it only supplies short term bursts of moisture to the skin. If you stop using it, hands return back to a drier state. Thus, in order to keep skin smooth, soft and moisturised throughout the day, I found it was necessary to use the hand cream frequently, around 3-4 applications every day. One of the requirements of a Benton supplied product is a before and after comparison. Looking at the before (left) photo, the skin on my hand definitely looks a little dry. A few minutes after applying, there is a dewy finish that is observed on the right, moisture fairly well retained until the next application. 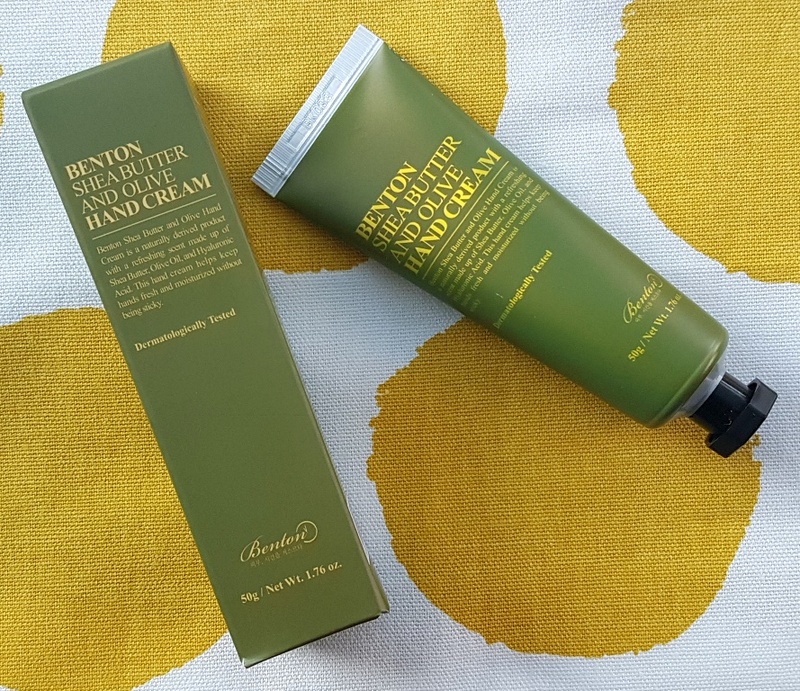 The Benton Shea Butter And Olive Hand Cream is a lovely hand cream that I use with pleasure. I love the fresh but delicate scent and particularly enjoy its non-greasy, non-tacky finish. It leaves my hands soft, supple and moisturised throughout the day and I have no hesitation giving it my tick of approval. This product was provided to me free of charge by Benton for review. This post only includes my honest opinion and experience of this product and is in no way influenced by Benton, any of its representatives or any other third party.